The cable belongs to a new generation as its two open-top cabins will offer passengers a unique 360-degree view of one of the most beautiful panoramas in the Alps with views of Mont Blanc, the Cime de Bellecôte and the Aiguille de la Grande Sassière (3,747 m). The lift is designed to withstand the weather at an altitude of over 3,000 m, and was Swiss designed by Garaventa AG and equipped with state-of-the-art comfort and safety technologies. It will first open to skiers this winter once the ski area itself is opened. But only open to the public in May, when extreme weather is over. Financed by STGM)—the company operating Tignes ski area—this tramway is part of a 17million Euro investment project between STGM and the Vanoise National Park. 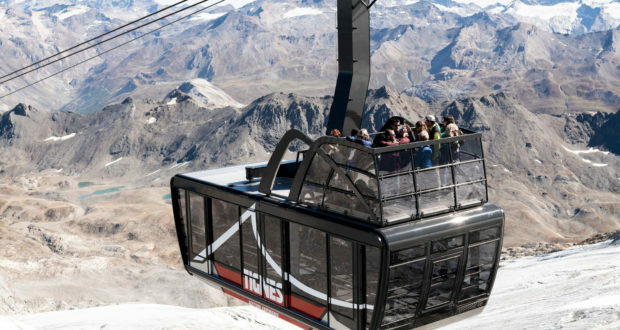 The flight starts at the Tignes funicular station at 2,100 m and will reach the Grande Motte Glacier at 3,032 m. From May 2019 it will be open to all, including people with disabilities. On the Grande Motte Glacier Travellers will feel they are flying through mid-air. In addition, educational materials in various shapes and forms will provide information on this exceptional environment and ecosystem.